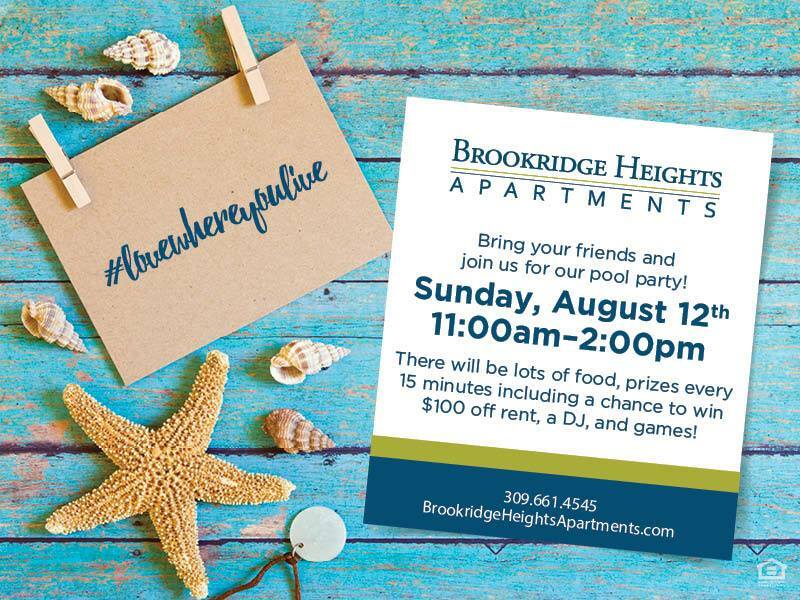 Brookridge Heights Resident Only Event!! Brookridge Heights residents!.. You won’t want to miss all the prize giveaways donated by Eastland Suites Hotel, DoubleTree Hotel,O'Dears, Hy-vee, Fox and Hounds, Marcus Theaters, Go Green Cleaning, Braize, Tobins , Astra Furniture , The Spotted Dog, Cort Furniture, Cornbelters, Little Beaver, Upper Limits, Hacienda Leon, Ginger Bread House, Gill Street, Windjammer, CoreLife , B-N Spine Clinic, and of course a chance to win $100 off of your September Rent! Along with all the prizes we will be serving AMAZING food provided and donated by Signature India, Avanti's, Papa Johns, DP Dough, Insomnia Cookies, DoubleTree Hotel.